(CNN) -- "American Idol" viewers had a clear choice when it came down to the final decision: the low-key but sincere Kris Allen or the flamboyant and powerful Adam Lambert. 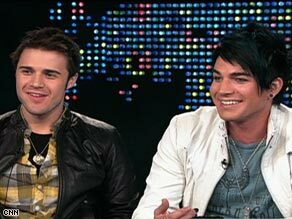 "American Idol" winner Kris Allen, left, and runner-up Adam Lambert say they're good friends. The vote went for Allen, and Lambert told Ryan Seacrest on CNN's "Larry King Live" that the outcome didn't surprise him. There are no hard feelings, though. Allen, Lambert, Danny Gokey and the other seven finalists spoke of their friendship and camaraderie on "Larry King Live." Here is an edited transcript of the interview. Ryan Seacrest: I think the first thing you said [after being announced as the winner] was "Adam's great." Actually on the air, you were complimenting him at the moment you should be complimenting yourself. Seacrest: So aside from getting more votes, why do you think you won? Allen: I don't know. I think it was a combination of a lot of stuff. It was maybe, probably, a little bit of personality, a little bit of -- hopefully it was about the music, as well. I know that's not always the case on "American Idol." That's what I care about the most: the music and how I portray it. Seacrest: It's no secret that you're a man of faith, that you referred to the "Christian thing," as it were. You didn't rely on the Christian vote. Do you think that played a part in your win, though? Allen: I hope it didn't. Because I guess me and Adam were doing an interview before the show: "Kris, do you think you're going to get the Christian vote now that Danny's gone?" And that was rough, that was kind of upsetting, because the show's not about religion. We're not running for president. We are there to do music and there to sing, and hopefully people vote on that. Seacrest: I've seen the show 300-plus episodes, and I know that you have to develop some sort of strategy. So what was yours? Allen: I think my strategy throughout the whole thing was, 'don't steer away from what you know how to do.' And that's just go out there and be yourself. I went out there and I played my type of music. And I really wanted to change stuff up a little bit and be kind of bold in my music choices, and just do what I believed in. Seacrest: You guys have been through it. The question everyone wants an answer to, finally I get to ask you. What kind of guy-liner do you wear? Adam Lambert: I don't know, whatever the make-up artist puts on me, you know. Seacrest: In that beat before I [announced the winner], what were you thinking? Lambert: I kind of figured, OK, it's anyone's game at this point. I knew it was going to be a close race. And actually in my head, believe it or not, I went, that's so Kris, it's so going to be Kris. I felt it. Seacrest: You're human, so you had to be let down a little bit. Seacrest: So what do you think happened with the voting? The judges called you the darling throughout the course of the season. And then you didn't get the first-place votes. What happened? Lambert: Well, I'm sure that when Danny was out of the competition, I think his fans probably would be more apt to go for Kris' style. Allen: I think a lot of people thought that too. Lambert: I wasn't worried. I just assumed that would be the case. Lambert: Kris' appeal is more like Danny's appeal than mine. I just kind of figured. Seacrest: Does the fact that the judges pick you out early in the season hurt in the long run? Lambert: I kind of think it helped me because I think that because I'm something a little bit different, it allowed people at home to feel it was OK to root for me. Seacrest: Kris, how did you size up the rest of the competition? Allen: Well, I think Adam and Danny were, I mean, very -- I think they were the front-runners for a long time. And they're amazing. So kudos to them. I think they deserved it completely. But I never went out there to beat anyone. We talk about that a lot. Seacrest: I can't believe that totally. You never went out there to beat anyone ever? Allen: No. How do you compare me or Adam or me or Danny or me or Matt or me or Allison? Seacrest: I've done the show for eight seasons and we've never seen anyone quite like Adam. That's great. That's the beauty I think in the show. It can continue to reinvent itself with the contestants. Seacrest: Kris, how did you feel about the love Adam was getting from the judges during the season? Allen: I thought he deserved it. I think he's amazing. I think he was probably one of the most original and one of the most -- seriously, one of the best singers that's been on "American Idol". Lambert: This is why we're friends. It's real. Seacrest: Let me ask you this: The speculation about your sexuality, do you think that had anything to do with coming in second place? Lambert: No, I think if anything, I think it -- I think my lifestyle is just I'm different. I'm a little bit -- I'm not your typical guy next door. The guy next door versus the guyliner. Sexuality aside, I think it more had to do with maybe my appearance and what songs I gravitated toward and my performance style. I think that had more to do with it. Seacrest: Kris, when I asked the question, you were nodding your head, why? Allen: Because I agree with him. It's not about who he is or who I am. It's about -- what we want, we want it to be about the music, you know?